i adore spring, a time of new beginnings and fresh starts. every year i look forward to the freshness & renewed energy spring brings to the garden, neighbors and table. the first beautiful day of spring everyone walks about town with huge smiles on their faces. spring is a happy time - who doesn't like happiness? this sweet treat reminds me of spring- full of goodness & happiness. 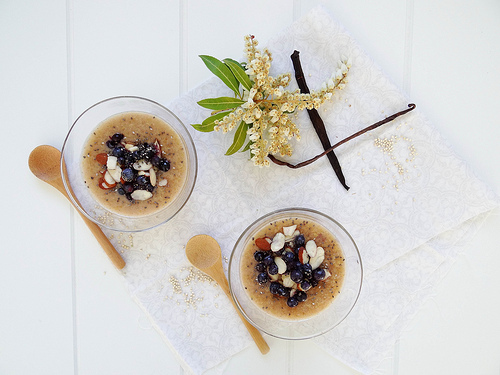 to simply put it, coconut quinoa pudding topped with sliced almonds, chia & wild blueberries puts a smile on my face much like the first day of spring does. truth is i have never had or made any type of rice pudding. 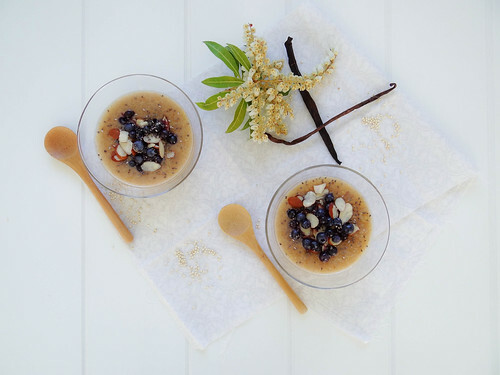 after seeing a few different posts & pins on rice pudding i thought I'd give it a try- i became even more intrigued when i saw a few version's made with quinoa. it was officially placed on my must make list. i was inspired by a version from Ashlae over at Oh Lady Cakes, however i can't seem to find the link to her version, regardless you should head over and check out her blog, she is pretty amazing. 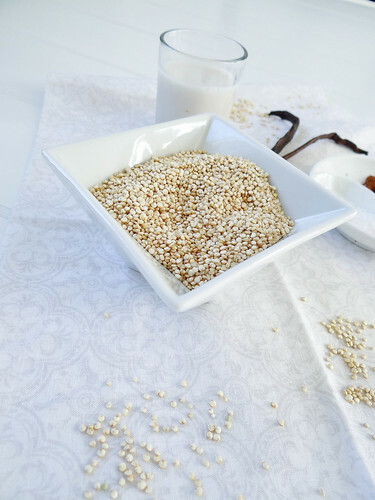 in a medium sauce pan add quinoa through vanilla - gently whisk until cinnamon is evenly distributed. bring to a bowl, cover and reduce heat to low and simmer for 35-40 minutes until mixture thickens. remove from heat and allow to cool slightly. 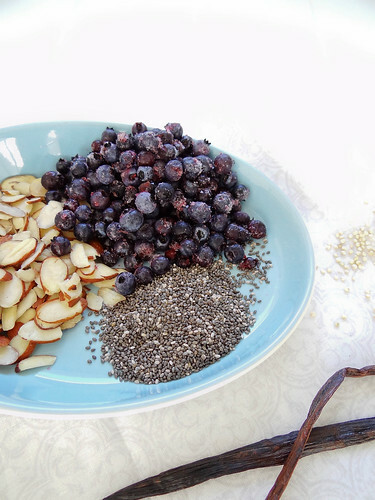 ladle out 6 portions and top each serving with blueberries & almonds; sprinkle with chia seeds. if saving a portion of the pudding for later store in a container without the toppings and top just before enjoying. Choose 5 blogs you find inspiring to award this to. Show your thanks to the blogger that nominated you by linking back to them. Post the award on your blog and list the bloggers you are awarding it to. Share 5 facts about yourself! Alison @ this homemade life - Everything Alison creates is beautiful. her photos are stunning and her blog is all about real life. i never leave her space uninspired, i love how her pictures always tell a story. one day i hope to build & create as great a family as she has. 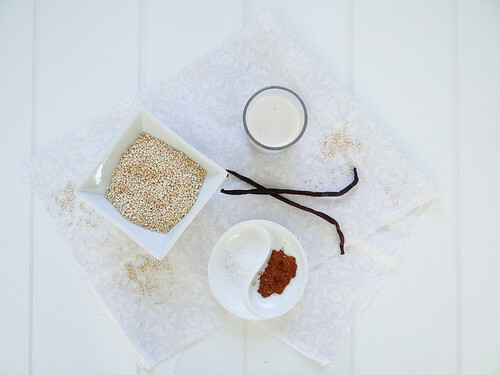 Ella @ Lifeologia: Oh Ella, I can't get enough of this girl and her blog. She is truly inspiring, you need to go see for yourself. Ashlae @ Oh Lady Cakes: Ashlae's blog is so much fun - her humor and outlook on life inspires me. I never fail to laugh at least once while reading her posts. if i had a multiple personalities disorder i would want at least one of them to be just like ashlae. 5. my dream home has a big barn that i would renovate to include a loft studio where i would blog, create recipes, practice my photography. the lower half of the barn would be my guest house, this said guest house and loft studio is already designed in my head. Also, I'm exactly the same on 1, 2, 4, and 5 of your facts. Not quite 3, since I don't know your sister, but I still really want to travel around DC and experience all the great restaurants! Well you certainly are one of the most inspiring bloggers I know! My goodness, what a nice way to start the day. Thank you! 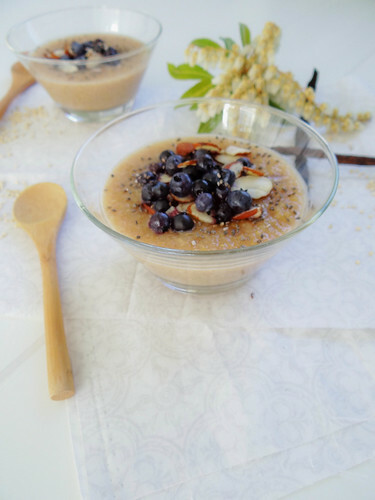 We've been enjoying a little more quinoa lately and I love the idea of making it into a pudding. Have a wonderful weekend! You are so welcome - it is well deserved! Ok, not going to lie - waking up to this made me smile reaaaaally big. Despite the fact that my stomach is trying to rid itself of the rest of last nights dinner. Anyhow - thank you! And I'm with you on all of your little facts, except I'd fly to Ohio to be with my five (yes, five!) brothers. 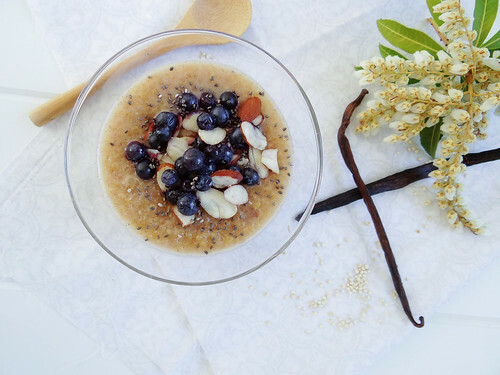 PS - adorable wooden spoons and as always.. gorgeous photos! WOW 5 brothers - there must be some craziness at your family celebrations! I LOVE your blog! Your pictures are divine, and I just Pinned a handful of them! You are definitely inspiring me to work on my food styling, not to mention great ideas for recipes! Also love the way you write. You are very genuine. I love it! The award is well earned!! PS. Let me know when you move out west! I'll be right behind you! It was so good - I keep sneaking spoonfuls just before I leave for work; it is so good morning or night! I love these pictures - so pretty! I keep seeing various recipes for forms of rice pudding, but I've never actually made it either. 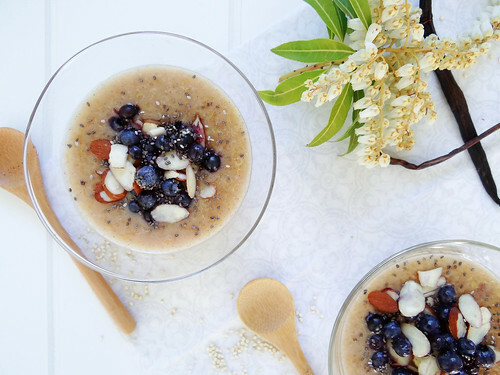 I think coconut and quinoa is the way to go though, sounds yummy! Also, I love the sounds of your dream home - I can just picture you blogging from your loft! I loved everything about this recipe, it was so much fun (and easy) to make! Congratulations on the award.. you totally deserve it! I love when you see and love the SAME elements in a photo as I do Richa - it makes me smile knowing that it doesn't go unnoticed - hmmmm I just have to convince Justin an start looking at realestate! I notice the texture and color play these days to learn from them. coz i can never figure out what to do for certain foods:)! the textured white compliments the pictures perfectly. I love learning from others too and playing around with textures and colors to see what works with a certain set! I haven't eaten pudding in about a gazillion years, and I've never made it from scratch! I should though... thanks for inspiring me! Lovely recipe and I must say your 5 things are kinda like me - the barn studio sounds like perfection from my dream too ;) Are you a virgo? I am actually a Cancer! ps. hope you get lots of sister togetherness as often as possible! 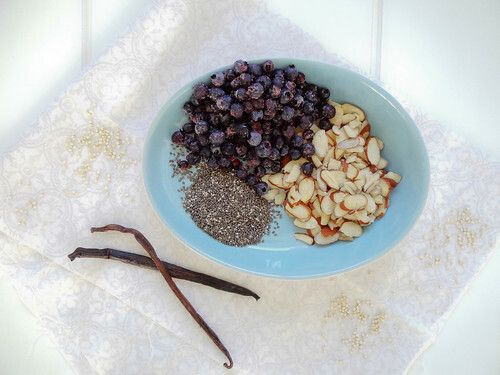 This sounds delicious -- and your photos are gorgeous! Yummy looking pudding! 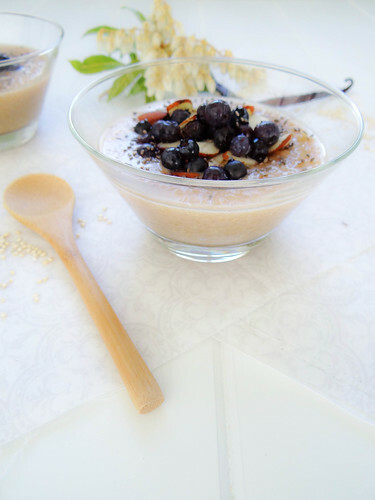 looove quinoa and coconut! 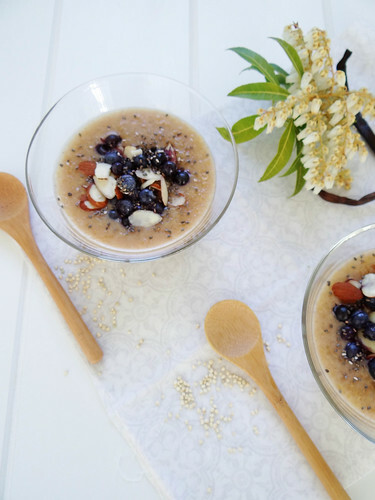 I love unsweetened coconut in just about anything - and quinoa has been making multiple weekly appearances over at our house lately! eggplant rollatini ~ Guest Post!